We’re fans of HB 122, Rep. Phillip DeVillier’s bill that would prohibit non-governmental organizations from receiving capital outlay funds. That’s a bill which puts a lot of money back on the table which could be used on roads and bridges and other infrastructure needs, not to mention it eliminates the potential for corruption; some of those NGO’s are nothing but politically connected scams designed to put money in the pockets of greaseballs. The bill rolled through the House, catching a 66-28 wave on the House floor last week, but it’s the kind of bill which tends to die in a Louisiana Senate infested with crooks, leftists and lickspittles of Gov. John Bel Edwards in both parties. The Senate’s Revenue and Fiscal Affairs Committee, which is going to hear the bill next, is an absolute nightmare, filled with some of the very people whose abuse of the capital outlay process this bill would address. So messaging the bill in advance with an eye toward building some public support for it is a good idea – not so much because public demand would necessarily carry the bill past that meat-grinder of a committee, but to make it a political cause celebre that someone might run on next year and others would bleed for their opposition. Ideally, a lot of the infrastructure problems need to go to the local governments to solve – not so much because Louisiana’s local governments are such paragons of competence and honesty in comparison to the state but because if the responsibility to handle roads and traffic locally is sent their way, perhaps the public will start to demand competence and honesty from them, and maybe we’ll get it. And if we can start building a culture of competence and honesty in our local officials that culture will begin to permeate the state level. We have some competence and honesty at the state level. Not a lot. And especially not with the capital outlay process, which is exactly as Schroder says it is – which is why U.S. News and World Report ranked Louisiana 45th in road infrastructure. “Our capital outlay system is broken. It doesn’t matter who the governor is, if you vote with the governor you get your project and if you go against the governor you don’t. 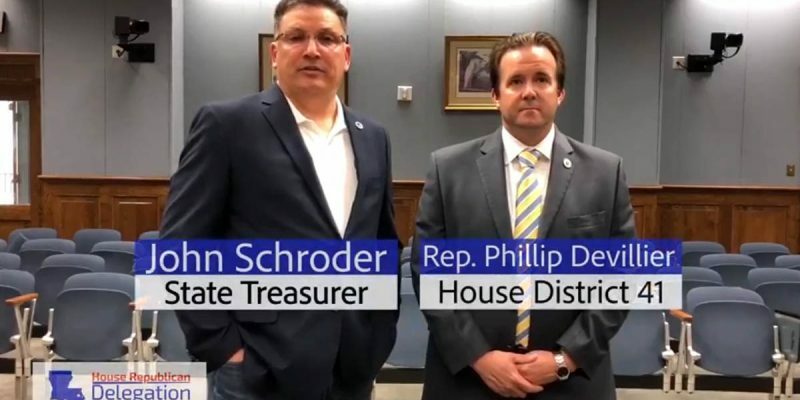 Rep. DeVillier’s bill takes direct aim at that,” Schroder said. “My bill will require Louisiana to fund important infrastructure needs over pet projects, begin to fix a corrupted capital outlay process, and put priorities over politics,” DeVillier said. Previous Article It Happened: What Is Hillary Clinton Complaining About Now?